Lightening usually doesn’t strike the same place twice but in 2018, I had the pleasure of visiting Thailand not once, but twice. A deep desire to visit Thailand always existed in me and finally, I bit the bullet and booked a month’s travel with a friend. We danced from the mountains to pristine beaches in the south island and hoovered street food, sporting mountain-grade backpacks. Upon returning home, I was overjoyed but the trip still felt incomplete. There was so much more to see, eat and learn, and I knew it. Six months later, thanks the mouth-watering #TOFTravels content on @ToFoodies that was oh so easy to create on-the-go, opportunity came knocking again. I was to travel back to Thailand as a guest of the Tourism Authority of Thailand with Bella Bucchioti, on a trip that would focus on food and culture. Wow. Truly a case of manifesting destiny. So with esteemed guidance from TAT and EXO Travel, I got a bit of a do-over in Bangkok and Chiang Mai and tasted Thailand, far beyond the backpacker experience. Sukhothai would be a first timer for me. Eat - Welcome cocktails + mocktails, and a platter of local fruits waiting in your room - just the tip of the iceberg for food offerings at Hotel Muse. For the first meal of the day, head to the rooftop restaurant for a buffet of breakfast. In a global city like Bangkok, great hotels like this one will have every cuisine imaginable at arms length, so feel free to rove from the omelette bar to the dim sum cart. The morning after a long day travelling, I found great solace in the yogurt parfait station and array of fresh tropical fruit juices. Not to be missed is Medici Kitchen and Bar, a speakeasy-vibed restaurant on the lower level where we shared an elaborate meal by Chef Bartek Cywinski. His finesse with dabbling in both Italian and Thai ingredients was remarkable, whipping out dishes like, for example, pictured below: local mud crab and tomato dust cannelloni with sturgeon caviar and avocado mousse. To top it off, literal opera singers from Fivera were singing the classics live as we dined. See - Bangkok cannot be summed up in one paragraph, but I’ll do my best to steer you right (and there’s more Bangkok tips at the bottom of this page!). 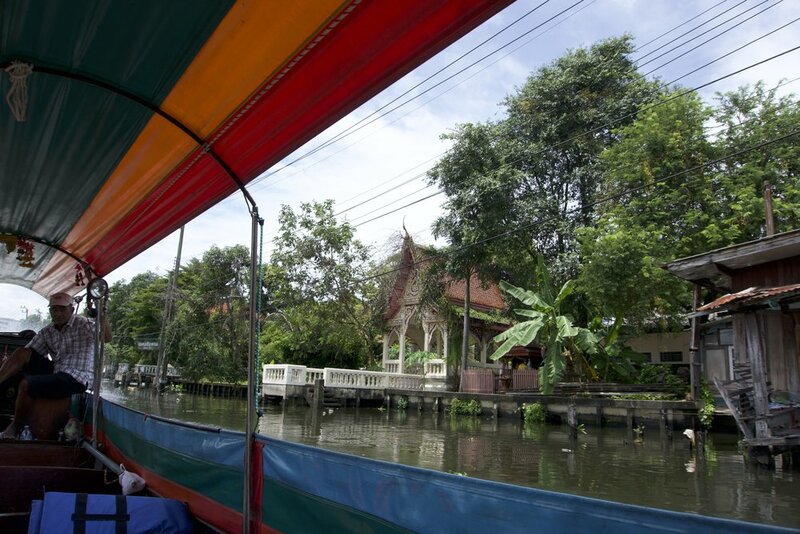 Take a Klong Tour (canal tour) in a boat ride to the stunning, meticulous temple of Wat Arun and don’t forget to stop and feed the catfish (there might be a little woman waiting on a porch to sell you bread, if you forget to bring your own). Go to Chinatown and take in the narrow alleyway shops. The spice market is must-stop for picking up new pantry stables like butterfly pea flower, fried garlic, saffron, and any spice under the sun. Venture to The Grand Palace (for 150 years, this was the home of the Thai King, the Royal court and the administrative seat of government) very early in the morning to take in artistry of royal architecture, gold mosaic tiles, a 14th century Emerald Buddha and all. Or get a different take on a Thai massage with Perception, where all masseuses are blind. There is simply so much to explore. Bangkok is a dense and lively city that takes over each of the senses. Click on the right side of this photo bar (below) to tap through our time at Muse Hotel! Stay - Once again, think speakeasy and apothecary-chic in style. The lobby and rooms fit the theme oh so well with baroque, feathery, marbled, bejewelled and touches. Each room is very well-appointed with options: a clawfoot tub or stand up stall, King-sized bed or velvety chaise lounge, etc. The rooftop pool is breathtaking and worth the time + photo opp. I can only imagine how invigorating a morning swim must be here. But it really was the service and tiny, little details that made this place so special to me. Back in Canada, I now sleep on a pillow embroidered with my first name and it’s all thanks to Muse, because they welcomed me to their hotel with a personalized pillow case that I got to KEEP! If you’re looking for a place that will impress and go above your stylish expectations, you’ve found it with Muse. ﻿Eat - Short stay, but sweet! To be greeted with ice cold Thai tea is a lovely thing, and the start-to-finish experience at SHR is lovely. We dined mostly at their indoor-outdoor restaurant and from what I hear, there is a brand new food area under construction. I had a dinner + breakfast here and highlights from dinner include a luscious pumpkin soup and homemade coconut ice cream, topped with peanuts. The breakfast dish was something I could have ever single day and have since tried to create at home: chicken fried rice with fresh tomato slices, cucumber and sunny fried eggs on top. See - Next door is a wonderful organic farm called the Organic Agriculture Project and it is a must stop. It is owned and supported by Bangkok Airways and stands as such a beautiful gesture of preserving land and community in Sukhothai. Spending the day here was honestly one of my favourite parts of Thailand Trip #2. I was given their traditional garments and got to experience planting rice as well as a thorough guide of the full life cycle of these tiny, beautiful grains. Lunch was also epic, looking out, knowing you’re eating just feet away from where everything has grown. For a change of pace, rent a bike and take in the scenery of Sukhothai Historic Park, a UNESCO heritage site with 21 historical sites that are extremely well preserved and astonishing up close. If you’re looking for it on a map or where to start, type in “Wat Maha That Sukhothai”, go there, then let your bike wheels guide you. Stay - Stay here and you will really feel like you are in Thailand. Amidst the rice paddies and mountains lies this heritage resort, complete with a castle moat. My room had a walk out patio entrance to a lavish pool that is so expansive, it could never be crowded. I was feeling quite queenly in my King bed and with a blackout curtain like this one, you could catch up on sleep for days. Bonus, Bella Bucchiochi and I got some sweet footage of us twirling around and swimming here. Eat - Chiang Mai FTW! The food at Dusit is never-ending and there truly is something for everyone. At both dinner and breakfast, the selection was positively towering and the chef just started sending some of his greatest hits to the table. Honestly, one of my top two favourite Pad Thai’s lives here and is served with little piles of chili flakes, cane sugar, crushed peanuts and half a lime to add in, as desired. Expect grilled meats and Chiang Mai sausage, plus sushi and every salad under the sun. For breakfast, and as a lighter breakfast eater myself, I suggest grabbing a typical rice soup but putting your own spin on it with the plentiful accoutrements available. See - Less madness than Bangkok but still a large city, Chiang Mai is a traveller’s paradise. Take in the shopping amongst street food stalls at night markets. There is SO much to see, but also Chiang Mai is a perfect jumping off point for multiple excursions. Duck out of the city for experiences like elephant bonding at Patara Elephant Farm or take in cooking classes by Pantawan Cooking or during a Chiang Mai Home Host (more info on these last two food excursions are coming in another blog post, shortly!). Catch the morning offering to monks at the base of Doi Suthep and see the best view of Chiang Mai from Wat Phra Thai Doi Suthep. In Chiang Mai, a great way to take it the actual city is just by walking around, so staying nearby the Old City boarders should allow for some great strolling. Stay - Charmed by DusitD2! Especially for the price point, this groovy hotel is quite accessible while offering a boutique hotel experience. I could spend a lot of time in that lobby! Everything you need is walking distance and the room had a fun design with an optional bathtub window/glass wall into the bedroom. Thank you for the gorgeous gift of a handwoven star! It is currently hanging on my wall and looking v. v. cute. The pool area follows that same groovy theme, this time with a funky, striped twist. All around, you’re in the middle of the city but it feels like you have everything you need on the island of Dusit. Eat - Run, don’t walk to Lebua Tower Hotel. AGAIN WITH THE BREAKFAST BUFFETS!!! Thailand always knows how it’s done but the breakfast bar here was frankly, shocking. It took a solid four trips each time to assemble the perfection that was my smoothie of the day (favourite: coconut, lime, pineapple), jam + toasts, cheese and meat charcuterie board, alongside a customized omelette. #worthit. Choose your own adventure. We also had the pleasure of drinks at Sky Bar. Both are sky high on some of the highest top floors, but the views are stunning and worth a wait. I tried the Red velvet cocktail with red berry tea-infused vodka, ginger liquor, vanilla syrup, and grapefruit. It was tart perfection with pop rocks-like textured mousse on top. My friend’s cocktail came bubbling in a takeout container - so inventiveness is big here! Next up, we dined at the two Michelin Star restaurant, Mezzaluna. What a time to be alive. Several deft servers danced around me while a quartet played Beatles classics and modern hits to the salivating crowd. We got a first taste of the autumn menu and pictured above, I have the sweet shrimp tartlet with green apple, cucumber, beluga caviar with lemon. The menu is always melding of Japan and French cuisine with only the finest ingredients and it’s shown through the multitudes of precise technique on the plate. P.S. this is another food experience I’ll detail in my upcoming Thailand piece. See - Back in Bangkok. Take a Tuk Tuk tour around the city and feel the wind in your hair in the tiny neon, motorcycle-esque carts (Pronounce it “Took-Took”). There are so many amazing temples to visit and it’s breathtaking how you could be puttering around and stumble up such beauty. I personally visited Wat Traimi (flip below to see pictures - over 5 tons of solid gold! ), Wat Suthat and Wat Arun and found them to be particularly drawing, but do some of your own research and see what speaks to you. And maybe to cap off your trip, you want one last cooking class and/or Thai meal at Blue Elephant - some classes includes a guided tour to local market! Check out the Pak Khlong Talat flower market and stop in on Floral Café at Napasorn for a smoothie. Hot tip: I like to save the bulk of my souvenir shopping for my final days in Bangkok. My advice is to always leave yourself at least 24 hours to just be in Bangkok with shopping on the brain. At places like MBK and on every street corner, you can find deals galore and be able to double your wardrobe in a quarter of the price. Stay - What showstopper last hotel for our final stay in Thailand. I felt like the luckiest girl in the world walking into my suite, nay, full-on apartment with a stocked fridge, soaker tub and balcony looking out on the 54th floor overlooking Bangkok - all just for me! This hotel is where they filmed The Hangover 2, so it’s no surprise that there is constantly a line up to get up to the Sky Bar. Not for you, though; guests get first dibs on the stellar cocktails and views. From the soaring floral displays and live piano player in the lobby, to the decadent brunch buffet and palatial pool, this is surely a treat yourself stay. Thank you to the Tourism Authority of Thailand for the experience of a lifetime.